Based on the movie, American Tail: Fievel Goes West follows the adventures of a young mouse. 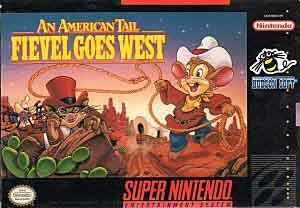 Play as Fievel as you go through 5 action levels in the Old West to rescue his family and defeat Cat R. Waul. With only three minutes for each level, move quickly and destroy enemies through the sewers of New York, a runaway train, the desert, and Cat R. Waul's hideout.